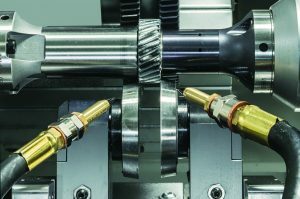 A description of one helical gear application in which an improvement was achieved through the elimination of profile modification. 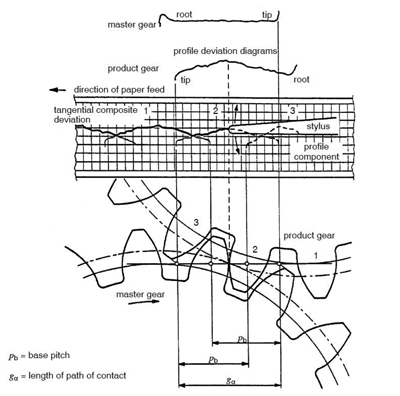 This paper describes the work performed to reduce first order gear mesh vibration, which was the root cause of an excessive gear “whine.” It includes a discussion for introduction of an unmodified involute profile (except for a short tip relief to smooth the tooth entry and exit into the mesh), inspection charts, significance of a statistical sample size for validation, vibration measurements, and correlation of tooth profiles to vibration results. 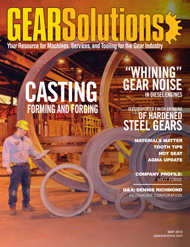 While many articles on gear noise reduction focus on introducing profile modifications, this paper describes one helical gear application where an improvement was achieved by the elimination of profile modification. 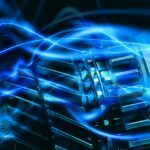 Noise Vibration Harshness, NVH, is a broad term that encompasses the study and development of noise, vibration, and sound quality. Within engines and vehicles, the gear train is one of many sources of excitation that affect NVH. 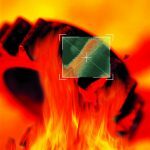 While significant effort is frequently focused on insulating (or protecting) an observer from the noise, engineers are also working to reduce the level of structure-borne vibration at the source, which causes the noise. 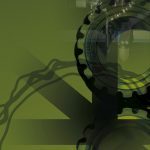 As major sources of noise within diesel engines and vehicles have successfully been addressed, engineers are paying more attention to the gear train that is increasingly becoming a more “visible” source of noise. This case study only focuses on the reduction of vibratory energy, not a sound quality improvement, which can be very subjective. Specifically, this paper discusses tooth profile geometry effects on first order gearmesh vibration, elimination of profile modifications to reduce vibration energy, and validation of a new design. 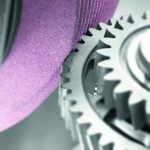 While many articles on gear noise reduction concentrate on introducing profile modifications, this paper describes one gear application where an improvement was achieved by the elimination of profile modification except for a short tip relief. 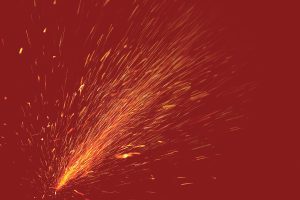 The vehicle OEM utilizing a particular engine model within our product line was investigating 5–10% of their products that exhibited a gear whine noise, which was subjectively deemed unacceptable. Based on vehicle noise data acquisition, the source of the gear noise clearly originated as the first gear mesh order within the engine’s geartrain consisting of three (14.23 normal diametral pitch, 20° normal pressure angle, and 20.5° helix angle) gears: Crankshaft gear (A), Camshaft gear (B), and Fuel pump gear (C) (schematic is depicted in Figure 1). However, the cause of noise was quite elusive. Frequent quality inspections were conducted; but a clear-cut quality problem could not be identified as the source of the gear whining noise. 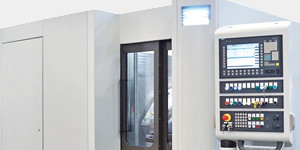 The investigation as well as the development of the design of experiment became a team effort involving NVH engineers, design engineers, the gear supplier, gear cutting tool suppliers, as well as engine manufacturing engineers and technicians. The vehicle OEM identified engines that had noise conditions described as ‘worst of the worst,’ WOW, and ‘best of the best,’ BOB under light to moderate throttle conditions. The decision was made to investigate a correlation between these engines’ vibration signatures and gear inspection data. The engines were returned to our engine assembly plant for analysis. Utilizing a mobile data acquisition system, engine vibration data focusing on the first gear mesh order (48th engine order as crankshaft gear had 48 teeth) was acquired on one WOW and one BOB engines. One WOW engine exhibited a 40% higher level of gear mesh vibration (Figure 2) as compared to the BOB. This degree of differentiation and a high level of repeatability in the vibration data provided confidence that there was a correlation to tooth geometric parameters. 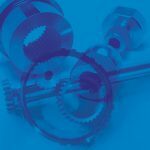 The gears from each gear train were then inspected on an analytical gear inspection machine for all the NVH critical characteristics: profile, lead, and index errors. Gear A had profile tip and root reliefs that were close to the tolerance limit (Figure 3) and gear B had tip and root reliefs that were slightly outside the tolerance limit (Figure 4). All inspected gears had lead and pitch characteristics that were within the tolerance limits. The legacy gear drawings specified a K-chart as the profile tolerance, but they did not specify an ideally desired trace (target) within that K-chart (see Figure 5). The K-chart did not explicitly require tip and root reliefs. However, the nature of a K-chart tolerance with a narrow band in the middle and a wider band at the tip and root implies that tip and root reliefs are not only allowed, but desirable. K-chart tolerance can create a condition for a significant part-to-part variation in the profile deviation from the pure involute. On one extreme end of the K-chart tolerance is a profile absent of tip and root reliefs while the other extreme is a tooth that has a significant tip and root reliefs. Both of these conditions are considered within tolerance. 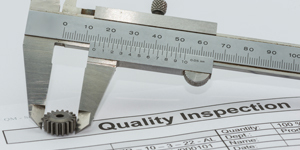 Another challenge with this K-chart tolerance specification was that it hindered a quantitative comparison of parts and a measurement of the process capability. Gears from an additional WOW engine were also inspected (see Figure 6, Figure 7, and Figure 8). Profiles of these gears were within the tolerance limit. Yet the gears had root reliefs that were close to the tolerance limit. Inspection of the BOB geartrain showed a somewhat lesser deviation of the profile form from the pure involute. Gear A, Figure 9, had a profile slope error that was consistent through the entire tooth. 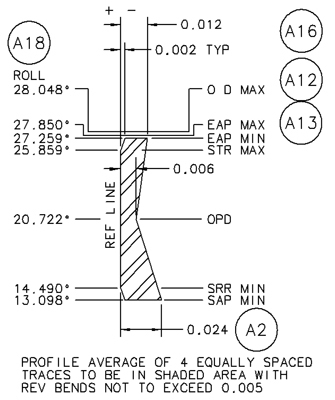 Gear B, Figure 10, had a part of the profile that was straight. Lastly, Gear C, Figure 11, had a profile closer to a pure involute. All three gears had profile and lead errors that were within the K-chart specifications. Index characteristics were also within the tolerance limits. 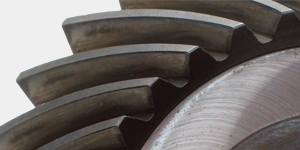 While most inspected gears had profiles that were within spec, there were dramatic variations in tip and root reliefs, both in form and amount. There was further confirmation of excessive profile variability while reviewing random production inspection records. The decision was made to a) determine and validate a tooth profile form for improved first order mesh vibration characteristics, b) re-target the tooth profile tolerance specification accordingly, and c) improve the process capability for a more consistent tooth profile and thus more consistent vibration performance. The plan also included a statistical validation of re-targeted profile. A statistical comparison was necessary because an accurate testing and assessment of how an individual geometric characteristic affects gear mesh vibration can be complicated by so many different modifying variables in the system including: a) alignment of gear axes resulting from a stack up of manufacturing errors of shafts, bearings, and housings; b) manufacturing variations of all mating gears; c) variations in structure response to excitation; d) variation in the bearing support and rigidity. 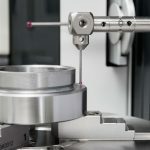 The decision was made to test at least 30 gear samples with a new profile specification to mitigate other influencing factors and provide more reliable results. In a perfect world, unloaded involute gears with conjugate tooth surfaces would transmit motion at a constant angular velocity, thus zero transmission error. 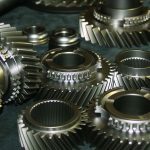 Gear imperfections, which create velocity variation, static transmission error, and vibration, are universally defined by three major characteristics: profile, lead, and index. These characteristics overlap in their effects on the static transmission error that in turn will result in gear mesh vibration. For several reasons, however, the plan was to retarget the tolerance for only one tooth characteristic: tooth profile. Both sets of BOB and WOW inspected gears had very small index (tooth-to-tooth) errors, typically 0.002–0.004mm. In contrast, the profile modification values (purposely-induced errors/deviations from a pure involute) were much larger—up to 0.012mm for tip relief and 0.024 mm for root relief (see Figure 5). 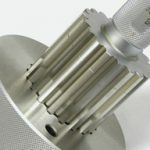 Lead errors (including crown, as it can be considered a necessary error) could also adversely affect static transmission error, especially for helical gears. 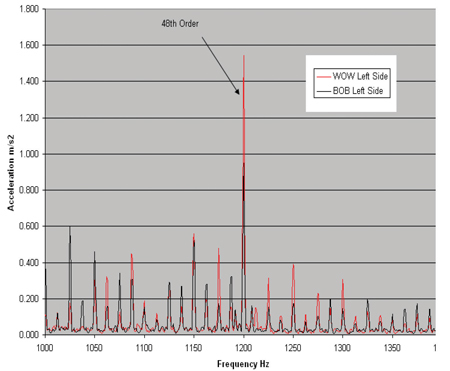 However, compared with profile modifications, both WOW and BOB gear sets had relatively small lead errors and a small crown with an average measurement of 0.009 mm. With lead and index errors considered to have minimal effects, the profile characteristic seemed to be the dominant factor responsible for a non-uniform transmission that induced first order gear mesh vibration. Profile modifications (tip and root reliefs) are purposely-induced deviations from a pure involute and are typically designed for only one specific tooth loading. The loaded tooth will deflect that will make the adjacent tooth interfere with the mating gear tooth (see Figure 12). 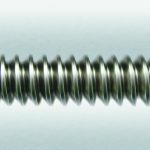 For a specific load/deflection, engineering can introduce tip relief or root relief, or both. 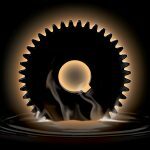 However, in diesel engines, the instantaneous forces applied to gears are continuously oscillating. Torsional effects create conditions so that not only do these instantaneous gear forces change their values, they can also reverse direction. At times, even tooth separation can occur. 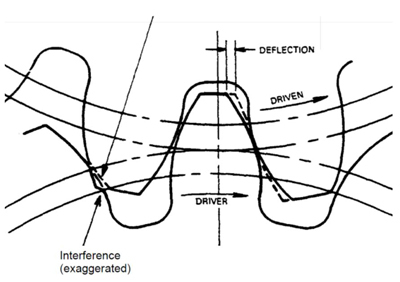 Figure 13 and Figure 14 illustrate the cyclical nature of torque that is transmitted through the crankshaft gear (driver) during an engine cold test (compression only) and typical engine firing, respectively. X-axis represents the crankshaft rotational angle and y-axis represents torque. 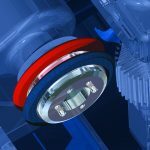 Thus, it was possible that during most load conditions, the tip and root reliefs were inducing non-uniform transmission resulting in vibration. One approach for specifying profile modifications (tip and root reliefs) is based on the highest and lowest points of a single-tooth contact area  . 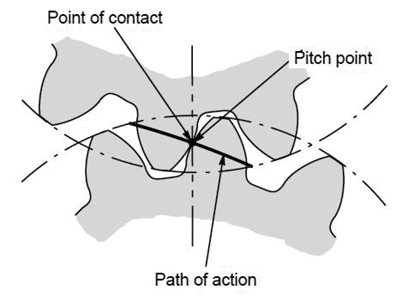 As the contact point moves along the path of action (Figure 15 and Figure 16, ANSI/AGMA 1012-G05), the load applied to a gear tooth changes depending on how many pairs of teeth are engaged at the same time. When a contact ratio is between one and two (Figure 17, AGMA 915-1-A02), the change in tooth bending within the contact path can be significant. Specifically, a tooth bending force can be doubled when two teeth pair engagement transits to a single pair. As a result, tooth deflection may vary considerably during the transition from a dual to a single pair contact. A tooth profile modification (tip and root reliefs) is typically introduced to mitigate the problem of the transitional tooth deflection. However, the gears in this engine application had a high contact ratio—transverse contact ratio was 2.13. That meant that, at any given time, there were at least two pairs of teeth in contact in the transverse plane. In addition, the axial contact ratio was greater than one (1.12) that further helped distribute the load evenly. 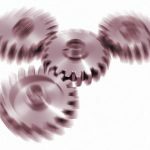 In reality, there were at least three pairs of gear teeth carrying the load at any given time. Thus, from a durability perspective, the large contact ratio negated a need for a profile modification. Therefore, the plan was to re-target the gear profile for a pure involute form. The only exception was a short tip relief/chamfer for a smooth entry and exit of the tooth. 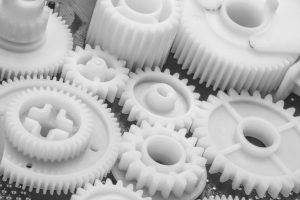 After developing a profile target, the team collaborated with both the gear supplier and their tool supplier to manufacture 30 controlled sets of gears. The samples were manufactured with no root relief and a very short (or no) tip relief. 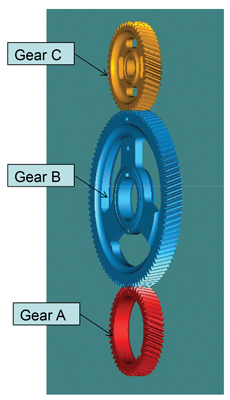 Figure 18, Figure 19, and Figure 20 illustrate typical charts of the prototype gears A, B, and C respectively. These 30 sets of gears were serialized and 100% inspected on an analytical gear checker. 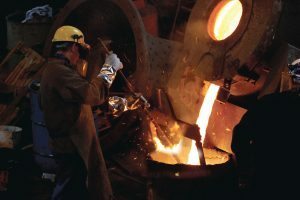 A production technique was developed to acquire gear-related vibration measurements on partially built engines near the end of the assembly line. 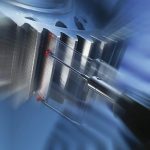 The engine is first loaded into the test station on a conveyer and then accelerometers on spring-loaded arms are robotically placed on the cylinder head of the engine. The crankshaft of the engine is then coupled to a motor to spin the engine. No combustion takes place during this test. The engine is swept through a variety of speeds. When a speed sensor measures a crankshaft speed of 1500 RPM, the vibration measurement begins. An order analysis algorithm was utilized to determine the amount of gearmesh related vibration present in the accelerometer signal. Order analysis is a method of deconstructing a time signal measured on a piece of rotating machinery to determine the amount of energy produced at specific rates relative to rotational speed. The algorithm used on the engine test station collects multiple revolutions worth of data from the accelerometer and speed signals. To separate the first gear mesh order (48th engine order) from surrounding orders, a resolution width of 1/16th order was used. The vibration level from multiple crankshaft revolutions was averaged and stored. This average value was used to quantify vibration performance of each gear set. With this technique, gear vibration measurements became a part of the standard assembly procedure. Utilizing the production test stand, the first gearmesh order (48th engine order) vibration measurements were acquired on 30 engines with the re-targeted profile and compared to the vibration recorded on the WOW engine. These 30 engines exhibited a significant vibration reduction. With vibration data now being collected as a standard production practice, a comparison was also made to a production run of 12,000 engines with gears manufactured to the original K-chart tolerance. 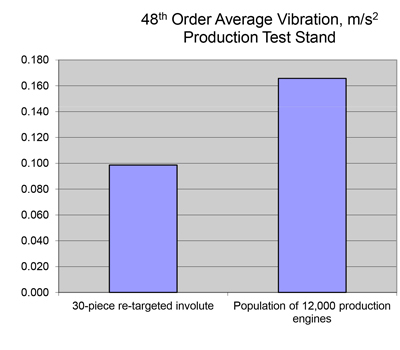 The 30 controlled engines exhibited an average of 40% improvement in vibration as compared to those 12,000 production engines (see Figure 21). 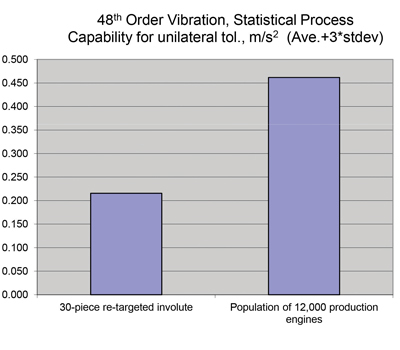 With respect to statistical process capability, the 30 controlled engines exhibited a 53% vibration reduction (see Figure 12). 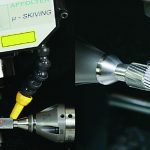 Tooth profile modifications such as tip and root reliefs have become increasingly popular over the last 30 years due to widespread academic research, development of sophisticated software modeling, development of modern computerized gear cutting/grinding technologies, and gear metrology systems. This has all led to less expensive means in producing profile modifications. Profile modifications are intended to compensate for tooth bending resulting from transmitted loads and to reduce contact stress at the tooth area where sliding friction is higher. 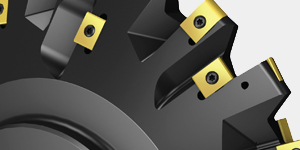 Profile modification is an important and necessary tool in the arsenal of a gear design engineer. However, one needs to be very careful in deciding if and how much profile modification should be introduced. The decision factors are the contact ratio, gear load variation, modes of operation, and the application’s noise sensitivity. “Too little profile modification causes involute interference noise, and if loads are high enough, tooth damage. 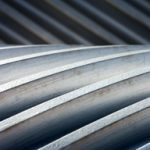 Too much profile modification causes an increased noise level and higher bending stresses,” writes Drago . 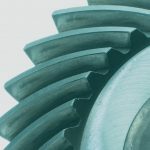 This case study has provided evidence that in a particular diesel engine gear application with a high contact ratio and variable/reversible loads, the elimination of profile modification led to a reduction of first order gear mesh vibration which was the source of a whining noise. is a vehicle noise and vibration engineer with nine years of experience ranging from diesel engines, construction machinery, and high performance electric vehicles. His focus is on the relationship between objective and subjective aspects of noise and vibration and how they are perceived and evaluated by the end user of the product. Marshall is currently working at Tesla Motors headquartered in Palo Alto, California. is a chief engineer at Navistar responsible for Base Engine Components including gears. 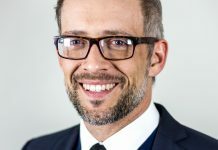 His prior gearing systems experiences include 17 years of design and development as well as lubrication and bearing topics. He has been granted a Master’s of Science in Mechanical Engineering from the University of Illinois. is a NVH chief engineer at Navistar Corporation for all powertrain applications. Sam has been granted a Bachelor of Science from the University of Illinois. 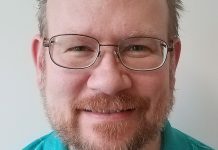 He has 20 years of professional experience in the areas of noise and vibration of rotational equipment in the automotive and paper making industry. is a technical specialist at Navistar responsible for gear design and validation. 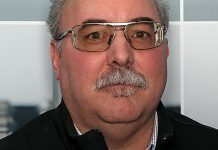 His prior experiences in the gear industry for over 30 years include development and implementation of various gear cutting and gear metrology technologies. 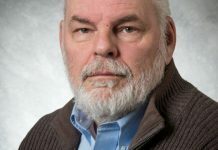 He has served on various AGMA Technical Committees and is an author of many articles on gearing subjects.